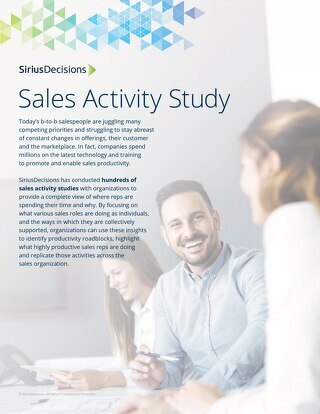 The SiriusDecisions Revenue Engine Planning Tool helps organizations align their cross-functional planning efforts to ultimately hit their revenue goals. This study provides organizations with a complete view of where their reps are spending their time and why. Identify functional, capability, prioritization and alignment gaps across product, marketing and sales teams. 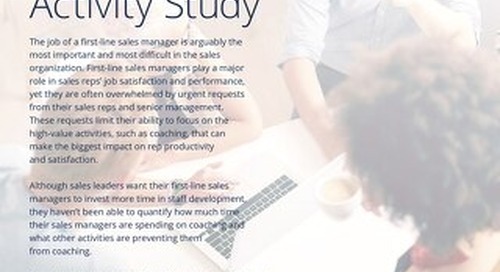 Determine how much time your sales managers are spending on coaching and what other activities are preventing them from coaching. In this guide, we share key priorities and data that will enable chief sales officers (CSOs) to turn the buying experience into a competitive advantage and hit their 2018 revenue goals. Access insightful data on your target buyers to create a superior marketing strategy. 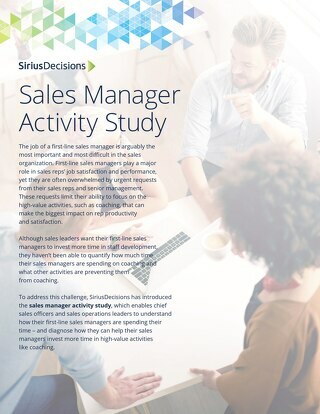 Explore the findings from SiriusDecisions study on the adoption, growth, execution, investment and impact of ABM across global organizations and how they compare to previous ABM studies. Support corporate growth objectives with these adjustments that are in line with those of your peers.